then we publish an issue devoted to our collection of good STUFF. Here ’tis! 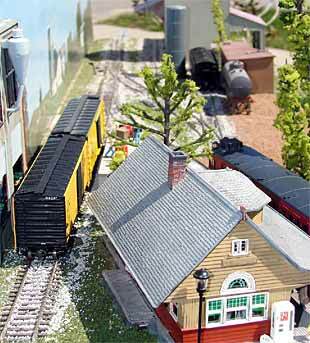 Possibly the smallest pizza layout ever built — and almost certainly the smallest operating radius ever used in O scale — was sent in by Mike Mackay, from Dartmouth, Nova Scotia, Canada. Mike explains, “The Silver Dollar Tramway is 0n30 (fairly accurately to scale, because gauge was opened up to about 17.5 mm to handle the radius) with dimensions 3.5×3.5 inches . The ‘baseboard’ is a piece of 2×4 cut square. The inner track is a promotional dollar coin, about 32 mm diameter. Since the motive power has two solid axles — albeit realigned as shown — the coin is free to turn in order to minimize wheel slippage. The carbody is a Peco 0n16.5 coach; the power from an old diesel truck [bogie].” Wow! 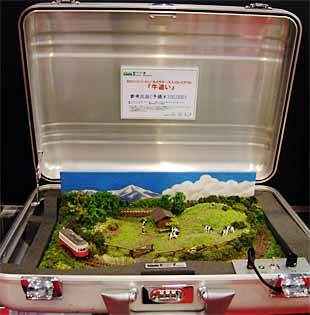 Anybody have a smaller candidate (in O scale)? Reader Terry Bossick, from Roseville Michigan USA, not only reads this site, he does something about it! 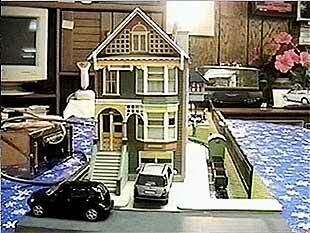 Terry signed up to give a clinic about micro layouts at his regional NMRA meeting in Michigan — and he presented it in the form of a video that included several layouts he built from designs he found here. 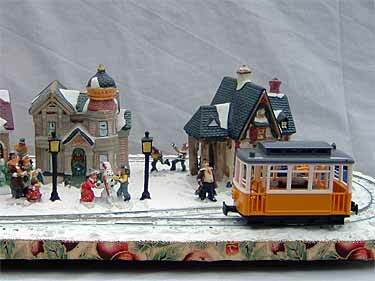 One of my favorites is Terry’s version of the Park Terrace Railway, a fictional backyard railway that Chris Gilbert, in Mansfield England, designed to fit with his house. Terry’s delightful version of this little line is shown above in two frames from the video. 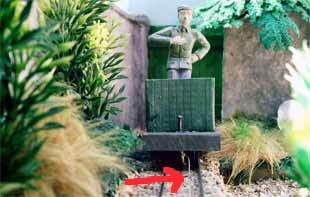 In the video, Terry spends a minute or so on camera, happily running the little train back and forth on this On15 (O scale on 9mm gauge) shelf line. HOW THINGS CHANGE FROM DESIGNING TO BUILDING! A very nice shelf layout design is Pine Ridge by Canadian Stephen Christopher. The design originally appeared on this site as a CN branchline terminus located in northern Ontario. It’s even featured in my new book [shameless plug – it’s on page 10] along with a couple provocative variations from the fertile mind of Jack Trollope. But as often happens, Stephen changed things in the course of building the layout. The “as built” design is shown in these two photos, and the plan is clearly visible on the control panel in the top photo. It’s a very nice switching layout — and quite different from his original design! We featured Stephen’s new design as a work in progress in Scrapbook #42 — and here are some up-to-date photos of the nice-looking finished layout. TOYS? 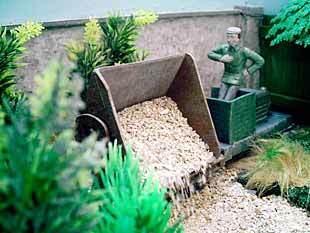 OR RAW MATERIALS FOR MODEL RAILROADING? 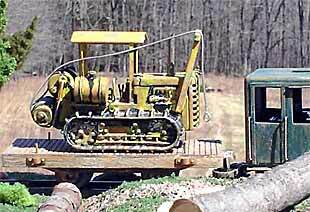 Gary Chapman, from Newark Valley, New York USA, converted an XTS Train System toy battery powered railroad into an operating HOn30 logging line, the Rex Lumber Company. 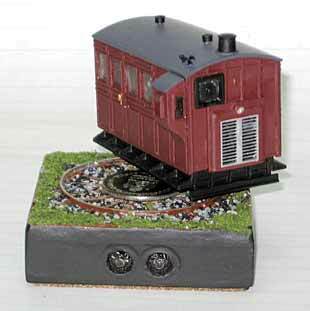 The XTS modular toy train sets use interlocking 6x6in modules with a track gauge of 9mm (N gauge), perfect for HO narrow gauge. 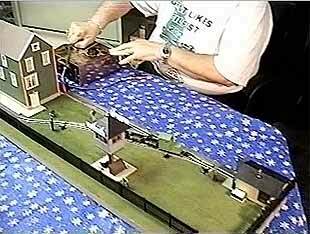 Bob Hughes, from Sandbach, Cheshire England, used a “toy” technique to animate a tiny N-scale layout without using a motor. 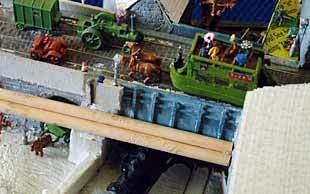 He calls it “puppet strings,” and he developed it first for a 19x4in N scale display layout called Schläfrigetal. 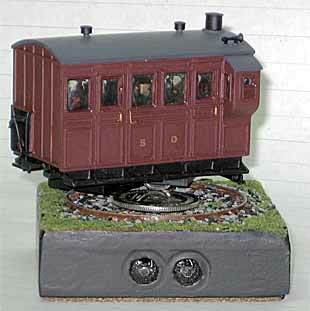 The train is powered by a loop of fishing line tied to the railcar underframe and looped through the ends on the layout and out of sight round the back, so there is no need for an electrical supply. As a result the layout is truly portable and can be used literally anywhere! Bob explains, “Schläfrigetal? It is German for ‘Sleepy Valley,’ for no better reason than that I liked the name (and happened to have a German VT135 railcar with a burnt out motor).” Bob also liked the puppet strings technique so much that he adapted it to his 23x7in Gn15 exhibition layout, Hayfinch. 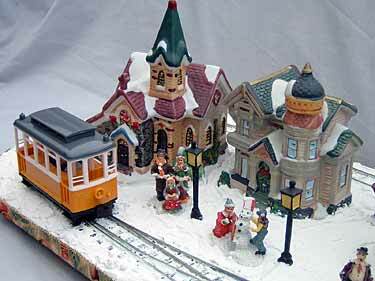 Hayfinch consists of a length of straight track and uses a picture frame to focus attention on the railway. The line hauls gravel from the crusher at left to the tip at right, and cars are visibly loaded and unloaded at opposite ends. 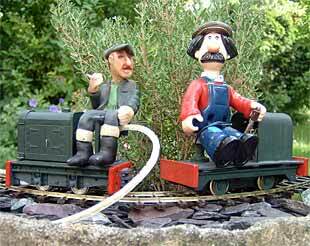 Hayfinch can be operated conventionally, with motorized locomotives, or in “unplugged” mode using horizontal puppet strings (fishing line) to pull unpowered locos. The “puppetised” loco is shown above at right. Bob points out that this arrangement allows him to operate Hayfinch while also running another layout at an exhibition — and he only needs bring one electrical controller. 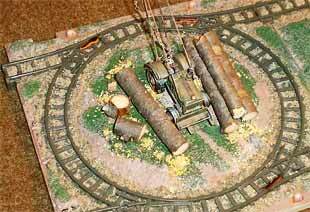 Peter Laband, from Redditch, England, found another creative way to use “toy” products on his industrial 15-inch gauge line. It’s a small Inglenook style layout, built on an 8x34in bookshelf in Peter’s home office. 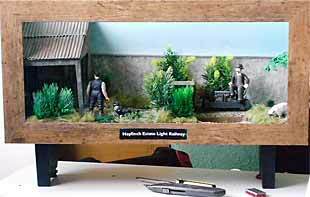 Peter uses 16mm scale and 16.5mm gauge (same width as OO and HO). Ed Note: Sounds like a lot of fun to me! SPEAKING OF INGLENOOKS… HERE ARE TWO MORE! “It is built on a 5ft x 8in plank. 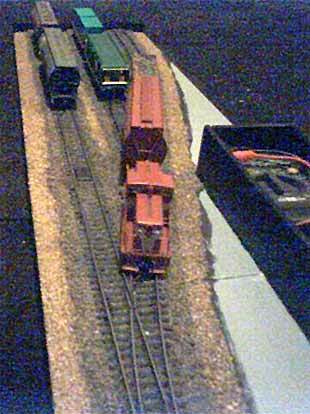 The long modern style wagons are not ideal for a micro-layout but they fit and are the same as I use on the club layout. The points are medium radius which again suits the wagons but not a micro layout.” That said, Sean has built a good looking 4-2-2 Inglenook railway! Technical note: Sean does not have a digital camera, so he took these photos with his telephone! Not bad looking, I’d say. From ever-inventive Jack Trollope, who lives in the Highlands of Northern Scotland, comes this switching game/puzzle. Jack explains, “The objective is to swap each car in the train for one of the same colour in the sidings, but reassemble the outbound train in the opposite order. As far as I can see this idea will work and keep the operator occupied for quite a while!” Anyone want to try it? 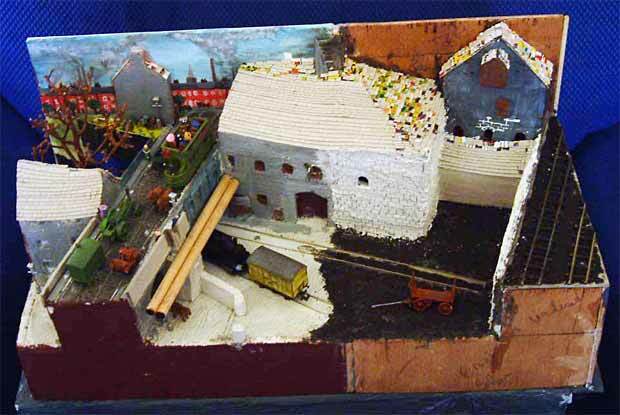 Inspired by this website, Marc Miller, from Tyne & Wear, England, is building Brewhouse Yard, an N scale shoebox layout set in the Edwardian era (early 20th century). Marc comments, “The size of the layout is 37x17cm. I’ve been building it for about six or seven months and it’s not yet finished, as you will see from the attached photos. The trackplan is basically a sector plate serving three sidings. I’ve had great fun building this especially as I can sit it on my lap and do some modelling while watching TV. 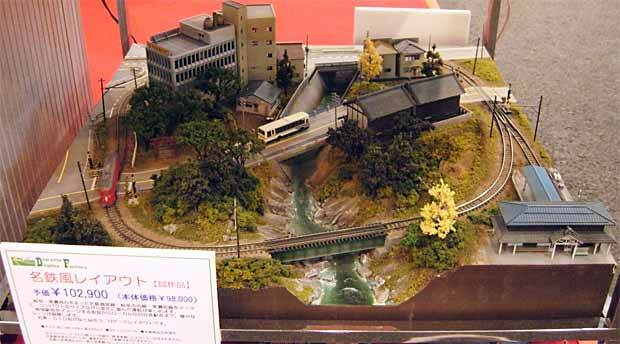 True armchair modelling!” I particularly like Marc’s busy tramway overpass (lower right). 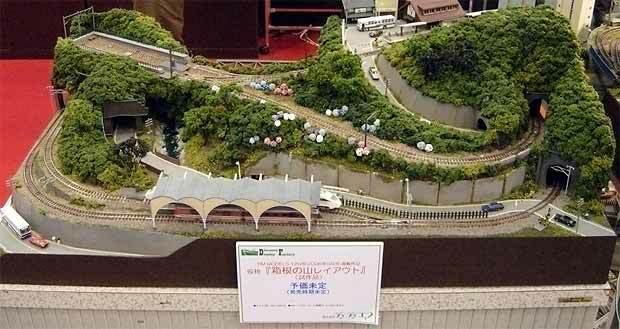 Our Japanese Correspondent, Hiromi Masaki, sent along these photos taken recently at the Shizuoka Hobby Show 2006, one of Japan’s largest hobby exhibitions. 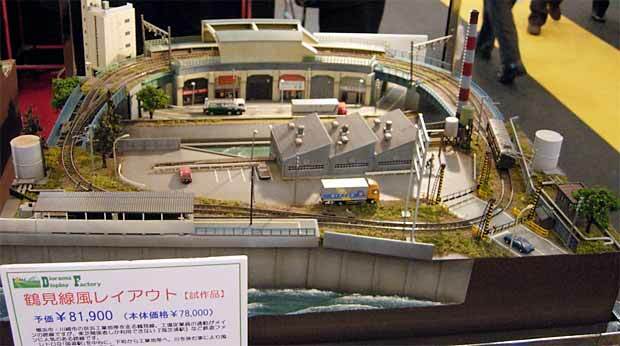 These elegantly turned out small layouts, mostly built in N scale, are commercial products of a company named Diorama Display Factory. According to the signs in the photos, the cost of each is around 80,000 to 100,000 yen — about $700-$900 U.S. dollars. Although not many of us will be in the market for one of these little gems, Hiromi points out that we can learn much and take inspiration from these well-done small layouts. 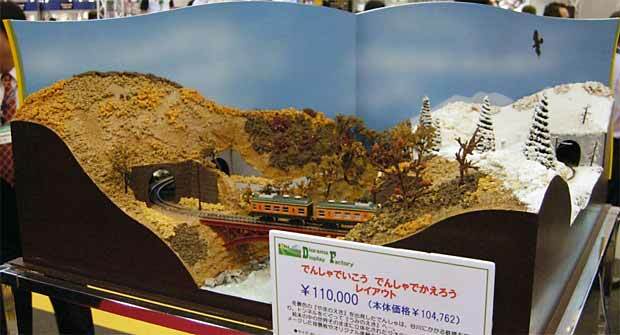 “These are good references for our modeling,” says Hiromi, “because [they are] nice reductions of the prototype.” So we’ll finish off this month’s Scrapbook page with some more photos of delightful scenic modeling from Japan. Domo arigato, Masaki san! Keeep on working, grfeat job!